It is with great pleasure that we invite you to explore "The Montreal Protocol Who's Who" where you will meet women and men from different cultural and social backgrounds from around the world and learn about their motivation, commitment, and actions to protect the ozone layer. Their combined efforts are making the Montreal Protocol into a success, providing a valuable lesson on how to overcome daunting global problems facing humanity. The Montreal Protocol Who's Who pays tribute to those individuals who were essential in realising this global effort for the sake of humanity and life on earth. This is an excerpt of a video produced by TVE International, and developed as part of UNEP's Work Programme Under the Multilateral Fund for Implementation of the Montreal Protocol. Produced on the occasion of the 10th Anniversary of the Montreal Protocol, this video describes the first decade of achievements of the global community in relation to ozone layer protection. It shows the chronology of initiatives taken following the warning given by scientists that CFCs were destroying the ozone layer that protects life on Earth against harmful ultraviolet radiation. The Montreal Protocol represents a great achievement at the global scale. This work started in the early 1970s, is now recognised as an outstanding example of successful cooperation between developed and developing countries and provides an excellent model for treating complex environmental issues of global importance. 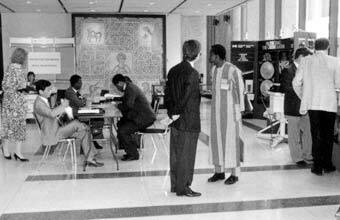 The success of the Montreal Protocol resulted from the dedication and commitment of a number of individuals from varied cultural and social origins from around the world. 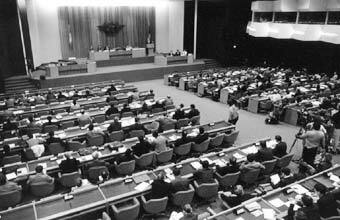 Combining their efforts they made ozone layer protection a reality and the Montreal Protocol a success. The "Montreal Protocol Who's Who" pays tribute to those individuals who played a critical role in realising this global effort to protect the ozone layer. 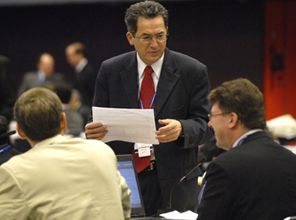 The "Who's Who" is intended to identify and chronicle the achievements of significant Montreal Protocol champions and serve as a reference tool for all those interested in how environment issues can be addressed on a global scale. The accomplishments of the individuals contained in the "Montreal Protocol Who's Who" should be inspiring and encourage you to find your own way to help make the world a safer and better place for future generations. The "Montreal Protocol Who's Who" is the first collection of biographies from the Montreal Protocol Community. The work, achievements and background of each of the individuals is described in a short biography embellished with photographs, video and memorable quotes. Entries for the "Montreal Protocol Who's Who" are based on nominations. Each nominator supplies the original information for an entry. Eligibility for inclusion in the Who's Who is based on the position of responsibility held and the contribution made to protection of the ozone layer. The integrity and accuracy of entries is ensured by a "Steering Committee" of key experts from the Montreal Protocol Global community. The authors have dedicated their entire personal capacity and lives to the fight for a better environment for all. Without their intelligence and dedication, the MP's unique success would not be there. In this book they extend their wisdom and experience to guide actions on our most serious environmental challenge: climate change. Mr Jukka Uosukainen, Advance praise: Technology Transfer for the Ozone Layer, Andesren, Sharma, Taddonio, 2007. "The core lesson that the ozone crisis teaches us is that 'it is much easier to break it than to fix it'. It is much easier to tip than to restore nature's balance. If we fail to learn this simple lesson, we are doomed"
Mr Janos Maté, September 23, 2010 : As quoted in the brochure of the 2010 U.S. EPA Montreal Protocol Awards. the Montreal Protocol and its institutions form the most successful global environmental policy initiative to date - as evidenced by universal ratification, compliance by both developed and developing countries, and the phaseout of 98 % of ozone-depleting substances. Dr David Downie, Still No Time for Complacency: Journal of Environmental Studies & Sciences, June 2015: 187-194. 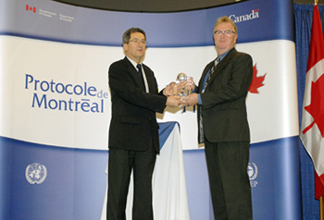 The Montreal Protocol is not only the most successful international environmental agreement, but no other treaty compares to the Montreal Protocol in positively transforming and steering the industry, particularly the small and medium-sized enterprises in developing countries, towards a sustainable and energy-efficient future. 1) "If we continue to develop the way we have for the past 50 years the planet is in trouble"
2) "If you are not prepared to share in the global obligation to protect the ozone layer then we are not going to trade CFCs with you"
The Montreal Protocol so far has been a success story and is paving the way to other conventions. We don't see any reason why progress and success should not continue. Global consumption patterns and our constant demand for more energy to fuel economic expansion have led to a steady increase of CO2 levels in the atmosphere, undisputed by the international science community as a key factor in global climate change. Contributing to protecting the ozone layer while advancing scientific knowledge on our planet is the most rewarding mission in my professional life. I feel proud to have brought my modest contribution to promoting technologies in developing countries protecting ozone layer and mitigating climate change. Effective phase out of ODS in Article V countries gives me particular pride. Mr Sidi Menad Si Ahmed, General statement not related to any particular event or date. After decades of chemical attack, it may take another 50 years or so for the ozone layer to recover fully. As the Montreal Protocol has taught us, when we degrade our environment too far, nursing it back to health tends to be a long journey, not a quick fix. But the overarching lesson of the Protocol is that by acting on one challenge, we also act on many others. "The Refrigeration and air conditioning industry must develop new technologies more sofisticated and efficient. This will bring, as consecuence, better appliances for the beneffit of the people, business and industry itself"
Mr Agustin Sanchez Guevara, Mundo HVACR Magazine, April, 2017. Reference to the adoption of the Kigali Amendment. After many years of monitoring and research, there is now clear evidence of mankind having affected noticeably and harmfully the whole global ozone layer. The strengthening of the 1997-Montreal Protocol with phase-out of the ozone depleting substances by 2000 will permit to reduce their harmful effect and aim at eventual ozone recovery at the middle of 21 century. 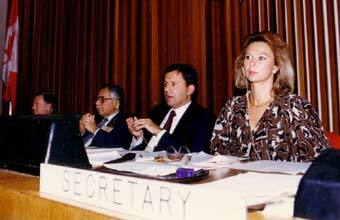 Dr Rumen D. Bojkov, Addressing the Second Meeting of the Parties to the Protocol, London June 1990. This early action on ozone has delayed climate change up to a Planet-saving 35-41 years. Mr Scott Stone, On the climate benefits of the Montreal Protocol's success in phasing out CFCs, E-Wire, September 25, 2007. The replacement of methyl bromide is not an easy task because there is no single alternative to replace it. The only suitable approach is the integration of various control methods. This means that the same principle applied in Integrated Pest Management should also be applicable to find sound control alternatives. The message of the Montreal Protocol was and remains that any environmental problem can be solved through a spirit of cooperation. "The efforts to protect the Ozone Layer allowed me to discover that we can work efficiently together regardless of nationality "
The Montreal Protocol is eliminating the use of methyl bromide, an agri-food fumigant -- while safeguarding agriculture, food processing and trade. Champions in the adoption of methyl bromide alternatives worldwide have included research scientists, farmers, grain millers, fumigators, food processors, exporters, regulators and, last but not least, Parties to the Montreal Protocol! Ms Michelle Marcotte, Michelle Marcotte, Methyl Bromide Outreach Conference, San Diego, 2009. The Montreal Protocol was a landmark in environmental policy making, being the first international measure designed to prevent - on the basis of scientific evidence - rather than cure a global environmental problem. There is now widespread agreement in the scientific community that ozone is leveling off in the 18- to 25-kilometer region of the stratosphere because of the Montreal Protocol. And we believe there is some tendency toward an increase in ozone in this region, though further study is needed to be certain. Life on the earth is, at present, without protection against the ultraviolet solar radiation intercepted by atmospheric ozone and would suffer serious consequences if the minute amount of this gas should suddenly disappear. Direct exposure to sunlight would, without the ozone screen, cause rapid and dangerous sunburn. The MP raised awareness of environmental issues for Northern Telecom. Fast phase-out of solvents and halons saved the company money, resulted in an improved product (circuit boards), and [led to global recognition for our leadership]. Northern Telecom’s leadership in meeting the Protocol well ahead of schedule empowered employees to move forward quickly on other environmental issues. An important feature of the Montreal Protocol, and one of the reasons for its success, is the differential treatment of developed and developing countries. Developing countries are given more time to comply with phase-out decisions, and in addition there is funding available to them from the Multilateral Fund provided by developed countries. Dr Ian D. Rae, Something in the air’, Environmental Chemistry, 2008, 5(1), 1-4. Chemicals pumped into earth's atmosphere decades ago still are affecting ozone levels today. This problem was a long time in the making and because of the persistence of these chlorine compounds, there is no short-term fix. The Montreal Protocol has been the world's life-preserver, keeping us from passing tipping points for abrupt and irreversible climate changes, including catastrophic sea-level rise--tipping points that may be as close as 10 years away. "The Montreal Protocol has been a very succesful environmental treaty since its inception. Its Kigali amendment agreed in October 2016 is a landmark achievement in climate protection. It is crucial for the world and for the African continent which is warming up 1,5 times faster than the rest of the world". In recent years an important advance has been made by the measurement of the vertical distribution of the ozone in the atmosphere. A digression, covering the war years, describes the measurement of the amount of water vapor in the stratosphere which, however, proved to have a bearing effect of the ozone on the temperature of the upper atmosphere. The history of science around the ozone layer demonstrates that without free and curious scientists we would not even know there is an ozone layer, let alone that it could be damaged by our actions. Contributing to repair of the ozone layer has been the most rewarding experience of my life, and working with other people who have incredible passion to achieve this goal is enormously empowering. Dr Ian Porter, Keynote address at the International Congress of Plant Pathology in Torino, Italy in August 2008. Since 1987 refrigerants are experiencing new constraints due to global environment. The protection of stratospheric ozone under the Montreal Protocol has led to the phase down and then the phase-out of chlorinated substances such as CFC-12 and HCFC-22 which were the two most used refrigerants. Ozone and aerosols provide the primary filter in the atmosphere that reduces damaging UV radiation before it reaches the Earth’s surface. While stratospheric ozone depletion has now stabilized and is beginning to return to pre-Montreal Protocol levels, the UV transparency of inland aquatic ecosystems remains highly variable and subject to increased UV exposure due to climate change. The historical experience of the Montreal shows that it is possible to avert a major global environmental threat through enlightened diplomacy, cooperation between industries (and between industry and government), and technological innovation. What is necessary is that the governments of the leading countries demonstrate in a clear and unambiguous fashion that the problem is going to be solved. The story of ODS smuggling offers many important insights in terms of global efforts to control trade in environmentally-harmful commodities. Yet while significant progress has been made against ODS smuggling authorities need to remain vigilant. Mr Julian Newman, Published in the EIA report "Environmental Crime - a threat to our future", October 2008. Electronics and communications companies are not newcomers to protecting the Earth's atmosphere and environment. In addition to contributing to energy efficiency, they have worked in the past decade to make their products in ways that eliminate the use of ozone-depleting chlorofluorocarbons. Start of healing of the ozone layer. An outstanding achievement! The Montreal Protocol is the globes most successful and effective environmental treaty. The Montreal Protocol ensured both developed and developing nations would take action on ODS to protect future generations against the deadly dangers of stratospheric ozone depletion. The Montreal Protocol is a instrument allowing strengthened environmental protection efforts globally. Mr Mark Miller, The quotation is dated July 31, 2009. Those of us who have been fighting for the ozone layer since the early 1980s look back in amazement at what has been accomplished. Most of us consider our work on ozone as the most important part of our lives. The Montreal Protocol has been extraordinarily successful at controlling the global use of ozone-depleting gases (ODSs). Long-term, high accuracy measurements of atmospheric ODS abundances made at many global sites have provided a solid scientific foundation for the Protocol to evaluate the role of ODSs in ozone depletion and the effectiveness of ODS controls. Dr Stephen Montzka, Atmospheric observations of ODSs have been an essential aspect of the protocol from its inception. The Montreal Protocol’s 20th Anniversary coincides with intense international debate on how to go about reducing greenhouse gases and stabilize climate change. As the world celebrates its success, its lessons should guide the international community’s search for a new agreement on climate change beyond 2012, when the initial commitments of the Kyoto Protocol come to an end. Mr Aharon (Ronny) Serry, Not available. We have had successes but the battle is not over. It is the obligation of all nations to continue their ozone research and monitoring programs because we leave in a period of important environmental instability. Prof. Christos S. Zerefos, . The CFCs and HCFCs were the refrigerant fluids of choice for many applications for many years up to the early 1990s, after which the non-ozone-depleting HFCs became favoured. The Montreal Protocol accelerated the rate of CFC and HCFC phase out in order to reduce ozone depletion, and this was only possible by using HFCs in many applications. The success of the Montreal Protocol stands as a beacon of how science can guide decision makers to overcome conflicting political and economic interests and reach solutions. Ms Marta Pizano, International Workshop on Alternatives to MB for strawberries and flowers, 2006 Mexico. The Montreal Protocol is the largest success of the atmospheric community and has not only succeeded to stop the destruction of the ozone layer but also slow down the dramatic increase of greenhouse gases in the atmosphere. In doing so, it leads the way to the Paris Treaty which should benefit from the experience of adjustments of the treaty which will obviously be necessary to be successful. Dr Marie-Lise CHANIN, The first sign of recovery of the ozone layer at all latitudes and even over the Antarctic is great! Our company pledges to invest only in modern, environmentally acceptable technology to avoid the use of CFCs, halons, carbon tetrachloride, and 1,1,1 trichloroethane. Our company also pledges to limit the use of transitional substances such as hydrochlorofluorocarbons (HCFCs) when suitable replacement become available. We also encourage our joint ventures and suppliers to make this pledge. Supporting parties to understand and take action to combine energy effiiciency with the F-gas transition can double the climate benfits of the Montreal Protocol as well as accelerating and scaling up econimic development whilst also enhancing public heath. This is an opportunity that we need to focus on urgently and concertedly. Military and civilian organizations use many of the same ODS for the same purposes. Collaboration based on shared uses is a rational way to accelerate adoption of solutions and reduce costs. This is particularly true for not-in-kind solutions that involve process re-engineering rather than a new drop-in chemical. A full understanding of the various causes of ozone decrease at a global scale requires accurate long-term measurements of not just ozone but also a broad range of chemical species and long-lived tracers that influence the ozone budget in the stratosphere. During the 20 years of operation, The MP has become the world’s best global environmental agreement, having phased out 95 % of ozone depleting substances in developed countries and 60 % in developing countries. The US estimates that by 2165 these efforts to restore the ozone layer will prevent 6,3 m deaths from skin cancer and produce $4.200bn in health benefits to society in that country alone. While the ozone treaty buys more time to avoid the tipping point for abrupt climate change while we get the post-2012 climate regime up and running, the Montreal Protocol also offers the world a beacon of hope – a model of successful environmental governance. Ms Romina Picolotti, IISD MEA Bulletin, Issue No. 37, 29 November 2007. The Joan Irvine Smith/Athalie Clarke Foundation and the Keck Foundation have been great supporters. Their resources have allowed us to study the Earth, to explore and quantify the behavior of the ozone layer, the sources of gases that comprise the air and that lead to human-caused radiative forcing of the climate, and now to the impacts of human activities like fossil-fuel burning and agriculture. One very important lesson we learned from the CFC-ozone depletion phenomenon is that society is capable of successfully addressing such global problems. It illustrated how basic research, motivated by scientific curiosity to understand nature, can lead to practical results that benefit society. The ozone layer is like a bulletproof vest - if you start thinning out the lead, you let more bullets through. On behalf of Mr. Klaus Toepfer, Executive Secretary of UNEP, I welcome all the participants at the 21st Meeting of the OEWG. The main issues you will be discussing, and formulating for your Parties the draft decisions, include the 2003-2005 replenishment of the Multilateral Fund and adjustments to the Montreal Protocol regarding the control of HCFCs. I wish you success at your deliberations. 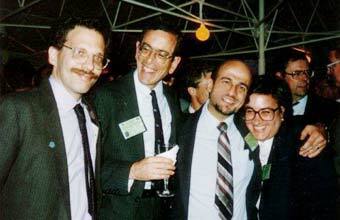 Dr Michael Graber, Speech given at the 21st Meeting of the Open-Ended Working Group held in Montreal 24-26 July 2001. The Montreal Protocol provides a dramatic example of science in the service of mankind. By quickly piecing together the ozone puzzle, atmospheric researchers revealed the true danger of halocarbons, allowing world leaders to take decisive action to protect the ozone layer. Dr Daniel L. Albritton, Science News, Report to the Nation on Our Changing Planet: Our Ozone Shield, 2005. The Montreal Protocol is saving millions of lives. In the United States alone, the phase-out is projected to prevent 6.3 million skin cancer deaths, 299 million other skin cancer cases, and 27.5 million cataract cases -- and even more world-wide. But the recovery of the ozone layer is not assured. Now is not the time to tamper with the Montreal Protocol or the Clean Air Act. The Montreal Protocol has shown itself to be the most successful international environmental treaty ever to involve joint cooperation between scientists, engineers and governments, as demonstrated by the achievements that have been made in phasing out all the ODS in developed countries and the steps that have been taken towards phasing out them even in developing countries by 2030 at the latest. It's a cruel thing to say ... but if we are looking at a slowdown in the economy, there will be less fossil fuels burning, so for the climate it could be an advantage. "Ozone depletion and climate change are highly complex and interconnected scientific issues that demand new measurement activities, including increased research on ozone evolution and monitoring as well as studies of the emissions, banks, and evolution of ODSs and their substitutes"
I think it's very important to make sure that we actually measure ozone, not only not getting worse but actually starting to improve, to be sure that the actions we have taken internationally have been effective. Thanks to the phase-out of CFCs, it made it possible to stabilise the ozone layer and strongly contributed to mitigate global warming. In 1987, the Parties to the Protocol recognized that over time, our scientific understanding of ozone layer depletion and its effects would improve. They also realized that technologic innovation would likely make future controls more technically and economically feasible. The comparative success of the Montreal Protocol has been achieved because the production and consumption patterns of ozone depleting substances have always been well defined, allowing focus on the key sectors of use. Nevertheless, the commitment of governments, NGOs, implementing agencies, former producers and users in a co-ordinated regime has been an exemplar of stakeholder co-operation. Mr Paul Ashford, Part of a presentation given to numerous public audiences on the challenge of climate change. Montreal Protocol is one of the successful international protocol which helped to Protect Ozone layer. People who are part of this protocol to transfer their wisdom and expertise to make other international environmental protocol to make is success. Dr Muthukumar Ramaswamy, Some of international protocols could not achieve their objective & hence above quote was made. Mr Jacques Van Engel, UNDP brochure on its work under the Montreal Protocol, 2014. The experience of a lifetime. An unbelievable opportunity to serve with so many amazing individuals at a global scale, with a single mission to make the world better for all. Mr Darrel Staley, A quotation written to complete this nomination. July 30, 2017. The independence of the bodies is important because it separates technological considerations from commercial or political interests. The climate protection already achieved by the Montreal Protocol alone is far larger than the reduction target of the first commitment period of the Kyoto Protocol. Additional climate benefits...could be achieved by actions under the Montreal Protocol, by managing the emissions of substitute fluorocarbon gases and/or implementing alternative gases with lower global warming potentials. Dr David W. Fahey, From "The Importance of the Montreal Protocol in Protecting Climate (Velders et al., PNAS 2007). The reason for [the success of the Montreal Protocol] is the fact that it is based on very sound, proven scientific advice provided by all three assessment panels. The willingness of the industry to switch to more ozone friendly products and processes played a major role in the success. The interaction with the climate change agreements are getting more important and needs much more attention. I thought maybe this is an ideal occasion to combine two things such that people have to restrict their uses by doing things better. I also thought maybe this Protocol would be a good instrument by itself to teach us how to deal with limits, ...but we do not discuss lifestyle, we discuss market opportunities. Dr Lambert Kuijpers, 1996, in "Ozone Connections"
Our combined efforts to comply with the Montreal Protocol are bringing the ozone layer back to the healthy state in which we found it when it was handed over to us by our parents. We owe it to our children and grandchildren to transmit the best possible environmental legacy. Mr Rajendra Shende, Malaysia Sun: Bhutan leads the battle for environment, 8 April 2007. The Montreal Protocol is a remarkable agreement. It is a successful collaboration between different countries, with a similar aim. Our challege is to consider ODS materials as process feedstocks, and develop treatment technologies which reduce the cost of disposal, and make better use of our resources. Our research is based on fundamental research, which has been developed to commercial scale. "Towards the development of processes for treatment of greenhouse gases"
The success of the Montreal Protocol is based on an ambitious, equitable, and sound framework for implementation. That's why it's worked for ozone AND climate protection. Now, let's take these lessons to the Climate Convention. If it can be done once, it can be done a hundred times. If it can be done in one field, it can be done in other fields. 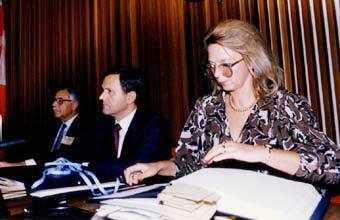 Dr Mostafa K. Tolba, During the signing of the Montreal Protocol, 16 September 1987. Mr K. Madhava Sarma, "Technology Transfer for the Ozone Layer: Lessons for Climate Change", 2007, Earthscan, London. The Montreal Protocol is a landmark agreement that has successfully reduced the global emission of ozone-depleting substances and thereby contributed to both ozone layer protection as well as reducing climate change. The historic Kigali amendment of 2016 will limit the future use of hydrofluorocarbons and contribute to additional climate protection up to 0.5 degrees Celsius in 2100. ODS phaseout activities has entered an important phase where sustaining ODS phaseout and implementing additional measures which are Ozone Friendly and which have minimum GHG emission impact is critical. The challenge is operating along multiple paths well aligned to achieve more environment friendly practices. Let us follow the Chinese proverb " Give a man a fish and you feed him for a day, teach a man to fish and you feed him for a lifetime". It's remarkable how the Montreal Protocol has evolved based on the principles of Start & Strengthen, Learning by Doing, and Intelligent Flexibility over Mindless Stringency to become the most successful environmental treaty. 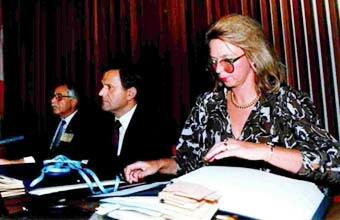 Dr Nancy Jean Sherman, Reflections on the 30th anniversary of the Montreal Protocol. The institutional space created by the Montreal Protocol invited all stakeholders to own part of the solution. Recognizing differentiated responsibility among the stakeholders, it committed developed nations to assume a correspondingly large share in solving the problem of ozone-layer depletion. One of the things we find as we go around is that still people are not really aware of the damage methyl bromide is doing to the ozone layer and why it is that you need alternatives. So at ground level there is a need for further awareness. Training is vital. If you are trying to get an alternative up and running you really do need training in its use. I am a proud coauthor of a scientific study documenting how early action by citizens and governments put the ozone layer on the path to recovery and forestalled climate change – buying time for the Earth while the Kyoto Protocol takes hold. The Montreal Protocol offered the opportunity of a lifetime to be part of mankind’s first international cooperative effort to protect the earth’s atmosphere. And we were successful! Fire fighting applications represent a tiny share of the total production and consumption of HFCs and PFCs (less than 2%). This combines with a very limited use of those products in the fire protection sector due to technical and economic aspects, as well as due to the introduction of conservation techniques first developed for halons under the pressure of the Montreal Protocol. 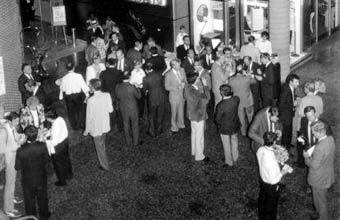 For more than 50 years, CFC-12 was considered a benign refrigerant. Replacing leaking refrigerant was accepted as a normal service procedure because of its low cost, but the Montreal Protocol which addressed the earth’s ozone depletion problem, changed all that. New regulations made it illegal to vent refrigerant, so the industry responded with new equipment and service procedures. Mr Elvis Hoffpauir, Written in his Last Watch column for MACS ACtion magazine, published in 2013. Now more than ever is the most important juncture of the Montreal Protocol. Our work on HCFC phase-out would allow us to close the book on the ozone layer protection and offer significant and critical contribution to the climate protection. Mr Viraj Vithoontien, Excerpt from statement made at the Initiation Meeting for China Stage II HPMP, April 2017. "All nations must reaffirm the choice of cooperation and consensus over conflict and uncertainty and the cause of protecting the Ozone Layer should continue to remain close to the heart of all the nations”. "Model calculations show that by the end of the next century (21st), atmospheric Cl and Br may return to those prevalent before the onset of the ozone hole, but only if imore stringent regulations are applied to halocarbon production than those currently proposed"
Prof. Michael Prather, From the abstract of Prather and Watson, Nature, 344(19) 729-734. The first Cl-loading paper. The MP paves the path for solving climate change, buying the world valuable time to reach agreement on how to address this greater global challenge. Its start and strengthen approach can help avoid dangerous tipping points for abrupt climate change and build a sustainable global solution that is both equitable and effective. Prof. Durwood Zaelke, Bali, Climate COP side event Lessons Learned from the Montreal Protocol December 2007. The ozone hole will recover to 1980 conditions around 2068. Dr Paul Newman, "When will the Antarctic ozone hole recover?" Newman, et al., GRL, 2006. Eliminating the use of ozone-depleting substances was one of the most challenging technological problems ever faced, but the efforts of mankind worldwide prevailed and solutions were found. There is currently much debate on whether carbon trading based so heavily on burning HFC23 constitutes sustainable development. The moral seems to be there should never be open-ended agreements on future emissions. Frequent reviews rescued the Montreal Protocol from deficiencies in the original draft, and another comprehensive re-examination is clearly needed. The Protocol is a model for effective international action on global challenges. Many talented people have dedicated their careers to ensure its success. I have been honored to be part of the U.S. governments efforts, and my work continues in the private sector on management of ODS banks to protect the climate system and help preserve and enhance the legacy of the Montreal Protocol. The continuing illegal trade activities in ozone depleting substances which have been a subject of great concern by Parties to the Montreal Protocol for many years is partly a result of either lack of import and export licensing systems for controlling ozone depleting substances or a result of lack of enforcement of legislation and regulations. 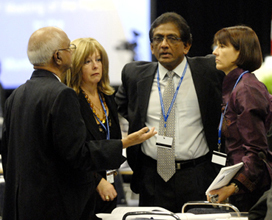 It is very unique that the countries of the world can put together a protocol (Montreal Protocol) that involves developing and developed to in-between, to equatorial and high-latitude to island nations, and they all come together every few years to discuss in a rational way what is perceived to be something that will make the world a better place. That's a rare thing. This is the first real-life endeavor of mankind to join hands to solve environmental damage that threatens our common habitat, the Earth. It proves that once the political commitment is there, national borders can be crossed to overcome a problem of a global dimension. Dr Omar El-Arini, Illegal CFC Smuggling Destroying Ozone Layer, November 20, 2000. The Montreal Protocol would never have succeeded as well as it did were it not for the willingness of participants to work hard to bridge differences and find some common ground on which they could agree. A quotation written to complete this nomination. July 30, 2017. 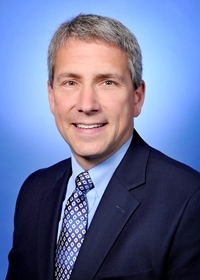 Darrel Staley has served as an Environmental Engineer for many years promoting more sustainable solutions to technologically complex challenges. Darrel Staley has served as an Environmental Engineer for many years promoting more sustainable solutions to technologically complex challenges. He spent years helping to document, invent and implement alternatives to ozone depleting substance. In 2002 Darrel was awarded the US EPA Stratospheric Ozone award as an acknowledgment of these efforts. Contributing author on many United Nation technical documents from 1991 to 2001 as a member of the United Nations Solvents Technical Options Committee. 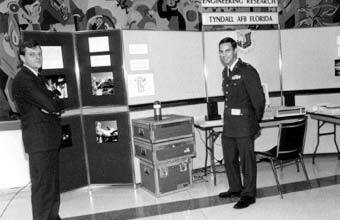 Precision Cleaning magazine 1995 “Revising Military Equipment Maintenance Documentation for New Cleaning Alternatives"
Dr. Ahmadzai is part of the global efforts, since 1987, to protect the stratospheric ozone layer. Dr. Daniel L.Albritton, now retired, was the Director of the Aeronomy Laboratory of the National Oceanic and Atmospheric Administration in Colorado. James Anderson established in 1986 that the unprecedented ozone loss over Antarctica involved atomic chlorine and chlorine oxide radicals. Paul Ashford has been a member of the UNEP Foams TOC since 1991. 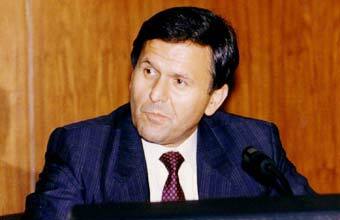 He has co-chaired the committee since 1998 and has served on TEAP since that date. Pr. Aucamp is on the Scientific Assessment Panel of UNEP and is a professor of environmental management at Northwest University in South Africa. RTOC Lead Author 1988-2007. Awarded both the 1990 and 1997 ‘Best of the Best’ Stratospheric Ozone Protection Awards for refrigeration recycling. Gilbert M. Bankobeza is Senior Legal Officer of the Ozone Secretariat. Dr. Jonathan Banks, Chair of TEAP QPS Task Force, is an Australian scientist and private consultant. You don't have bookmarked any profiles yet. Alcan Cocktail Reception, Ozone Diplomatic Conference. 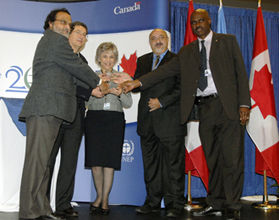 Left to right) Peter Usher (Science Adviser UNEP); Dr. Mustafa Tolba (Executive Director UNEP); Ambassador Winfred Lang (Conference Chairman); Iwona Rummel-Bulska (UNEP Secretariat). 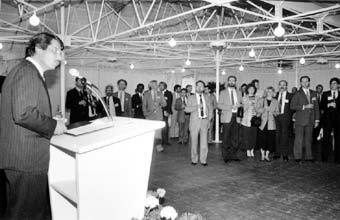 (From left) Jean Doré, Mayor of Montreal giving a speech at his reception for delegates to the diplomatic conference. 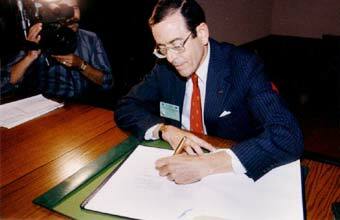 Ambassador Richard Benedick (State Department) signing the Montreal Protocol on behalf of the USA Sept. 16, 1987. 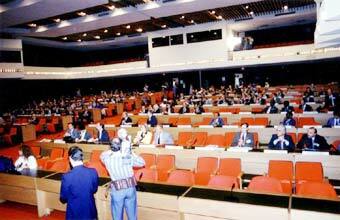 Arial view of Assembly Hall ICAO where the planning sessions were held Sept. 14-16, 1987. 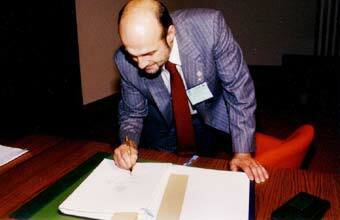 Vic Buxton signing the final Act of the diplomatic Conference in Montreal (ICAO facility) Sept. 16, 1987. 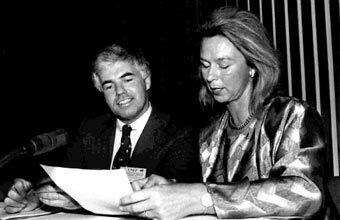 Day of the Signature of Montreal Protocol, Montreal, Canada, 1987. Dr. Iwona Rummel-Bulska, Executive Secretary of the Negotiations on Substances that Deplete the Ozone Layer Protocol with the visible original of the Montreal Protocol with the names of the countries present included. At her right is Prof. Vincent Lang present in the said Conference. 20th Anniversary Seminar of the Montreal Protocol "Celebrating 20 years of Progress"
Bruce Cox, Executive Director of Greenpeace Canada, receives the award for Greenpeace International. Title - Select a value -MrMrsMsDrProf. The person I am nominating has passed away. Fill in the name of the organisation where the nominee works. Describe the person you are nominating in one or two sentences (150 char. max). Insert a relevant quotation made by the person you are nominating (400 char. max). Indicate the title and date of the publication or video where the quotation appeared; or the title, venue and date of the meeting where it was spoken (100 char. max). If the quotation was not published, then just indicate the date. Describes the nominee and highlights various aspects of his/her experience related to the Montreal Protocol and ozone layer protection (1700 char. max). By accessing this site, certain information about the User, such as Internet protocol (IP) addresses, navigation through the Site, the software used and the time spent, along with other similar information, will be stored on United Nations servers. These will not specifically identify the User. The information will be used internally only for web site traffic analysis. If the User provides unique identifying information, such as name, address and other information on forms stored on this Site, such information will be used only for statistical purposes and will not be published or shared with any other organisation or company. The United Nations, however, assumes no responsibility for the security of this information. (a) The United Nations Environment Programme (UNEP) maintains this web site (the "Site") as a courtesy to those who may choose to access the Site ("Users"). The information presented herein is for information purposes only. UNEP grants permission to Users to visit the Site and to download and copy the information, documents and materials (collectively, "Materials") from the Site for the User's personal, non-commercial use, without any right to resell or redistribute them or to compile or create derivative works there from, subject to the terms and conditions outlined below, and also subject to more specific restrictions that may apply to specific Materials within this Site. (b) UNEP administers this Site. All Materials on this Site from UNEP appears subject to the present Terms and Conditions. (c) Unless expressly stated otherwise, the findings, interpretations and conclusions expressed in the Profiles on this Site are those of the nominated individuals and do not represent the views of the UNEP or its Member States. UNEP specifically does not make any warranties or representations as to the accuracy or completeness of any such Materials. UNEP periodically adds changes, improves or updates the Materials on this Site without notice. The User specifically acknowledges and agrees that UNEP is not liable for any conduct of any User. This site may contain advice, opinions and statements of various information providers. UNEP does not represent or endorse the accuracy or reliability of any advice, opinion, statement or other information provided by any information provider, any User of this Site or any other person or entity. Reliance upon any such advice, opinion, statement, or other information shall also be at the User's own risk. Neither UNEP nor its affiliates, nor any of their respective agents, employees, information providers or content providers, shall be liable to any User or anyone else for any inaccuracy, error, omission, interruption, deletion, defect, alteration of or use of any content herein, or for its timeliness or completeness, nor shall they be liable for any failure of performance, computer virus or communication line failure, regardless of cause, or for any damages resulting there from. This Site may contain links and references to third-party web sites. The linked sites are not under the control of UNEP, and UNEP is not responsible for the content of any linked site or any link contained in a linked site. UNEP provides these links only as a convenience, and the inclusion of a link or reference does not imply the endorsement of the linked site by UNEP. This Site collects personally identifiable information about the User when the User specifically and knowingly provides such information voluntarily on the Site by nominating Profile. The personally identifiable information the User provides when using the Site will be accessible by all users. If the User does not wish the information provided to be displayed on the Site, the User should contact the Site Administrator. Upon reception of a written request, the information will be removed. Nothing herein shall constitute or be considered to be a limitation upon or a waiver of the privileges and immunities of UNEP, which are specifically reserved. We are particularly thankful to the following persons. A special thank you to The Montreal Protocol Steering Committee Members and to Ezra Clark, James Curlin, Jo Chona, Rajendra Shende, and Saiful Ridwan for their valuable time and support. The "Montreal Protocol Who's Who" recognizes the outstanding persons safeguarding the ozone layer and implementing the Montreal Protocol. Thank you very much to all. Your efforts are sincerely appreciated.